Now we are well and truly into the swing of 2018, perhaps for you, the time has come to think about growing your business. After all, why not try and make this year a whole lot more successful than the one that has gone by? The trouble with sales and marketing is that it isn’t always easy to figure out the best approach to take and what is going to work best for you. Here at PeoplePerHour, we know a thing or two about making a successful business and it is our aim to share our expertise with the freelancers, entrepreneurs and small business owners who utilise our platform. So much so, we have put together a collection of blogs we have written, all to help you to make the most of sales and get your business on the map. We started off last year by taking a look at pitching, or more importantly, how you can ace even the most nerve-wracking of pitches. There are a variety of reasons why you may need to pitch your business, but the most common is when you are looking for funding and investors. 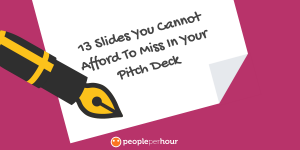 To help you along this sometimes difficult path, we presented our blog post covering the 13 slides that should be in every business owners pitch deck ready to grab the attention of whoever they are pitching to. Moving into March of last year and we took a look at something else that is becoming more common in business but are not entirely easy to understand. 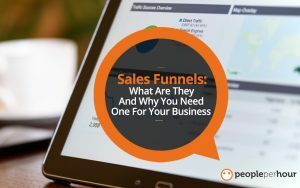 Sales Funnels. This blog was more a basic guide, covering not only what they are, but also why they are important to have for your business. This is definitely worthwhile reading if you are serious about boosting sales and growing your brand. It is no secret that one of the worst parts of sales for your business is cold calling or cold emails. The last thing you will want is to be seen as is a pest or spam, as well as spending the time emailing a variety of targeted customers, for them not to even pay any attention. This particular blog post from June of last year showed that whilst cold emails can work, there are a number of other, less scary methods to securing new clients for your startup business. Sticking with June of last year, this particular blog took a look at the world of websites. Particularly how useful a website is in a world where everything is dominated by social media. 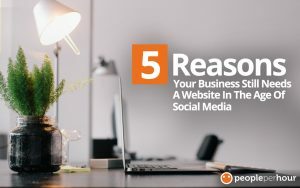 Outlining the 5 reasons why you still need a website, this blog post covered those aims and why it pays to make an effort with your digital store or website. As you can see, sales don’t always come in the same shape or size and sometimes there are different approaches that you can take to maximise your sales and hopefully grow your business too.